Dental Health Services Victoria (DHSV) was established in 1996 and is the leading public oral health agency in Victoria. We aim to improve the oral health of all Victorians, particularly vulnerable groups and those most in need. DHSV is funded by the State Government to provide clinical dental services to eligible Victorians. We help to provide Victorians with quality oral healthcare through The Royal Dental Hospital of Melbourne (RDHM) and by purchasing dental services for public patients from more than 50 community health agencies throughout Victoria. DHSV uses its leadership role to add value to its relationships with agencies to improve oral health and provide as many oral health services to as many eligible people as possible. 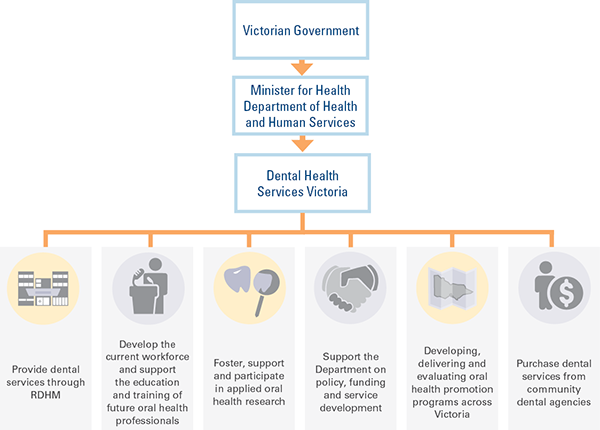 We are also guided by Victorian and national oral health plans, regional oral health plans, evidence-based oral health promotion resources and research publications. As trusted advisors in public oral health policy and program and guideline development, we continue to contribute to improving oral health in our communities. The history of The Royal Dental Hospital of Melbourne dates back to 1890 when dentists began providing voluntary services out of premises at 225 Lonsdale Street, Melbourne. Known then as the Melbourne Dental Hospital, it moved to 189 Lonsdale and then 193 Spring Street, before Victoria’s first purpose-built dental hospital was opened in Grattan Street, Parkville, in 1963. 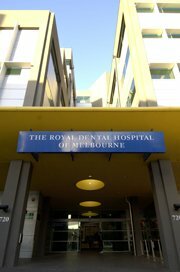 In 1969 its name was changed to The Royal Dental Hospital of Melbourne. In 2003 the Hospital moved to its current location at 720 Swanston Street, Carlton. The Royal Dental Hospital of Melbourne is Victoria’s leading dental teaching facility, working in partnership with The University of Melbourne, RMIT University and La Trobe University in the education of dental and oral health professionals.